In the Harry Potter books there is a large snake called a basilisk, but in real life there are really cool lizards known as plumed basilisks. Also known as green basilisks and Jesus Christ lizards, these large lizards have a body that grows up to 25cm long, plus a very long tail that makes them 90 cm long. 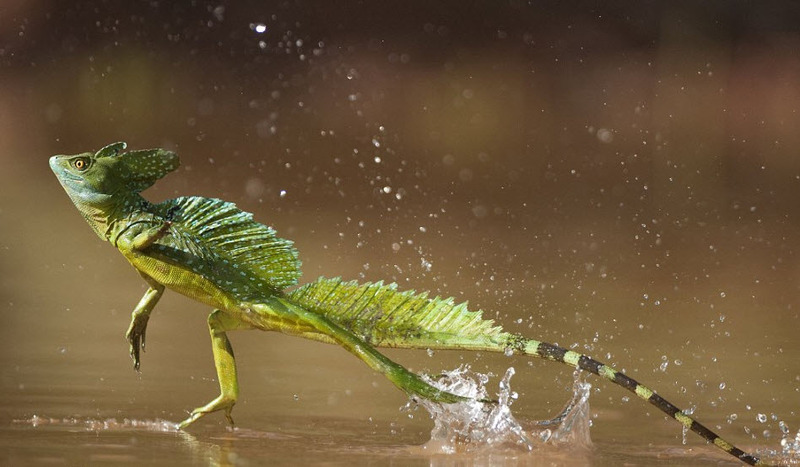 Plumed basilisks have the ability to ran on water for about 5 metres. They use their special long toes to balance on the surface as they run very quickly. They are also excellent swimmers and are able to hold their breath under water for up to 30 minutes. They are omnivores, eating a range of insects, fruit, small lizards, plants and rodents. At breeding time, females lay 15-20 eggs in a small hole in the ground. The babies take about 55-110 days to hatch and look after themselves from the day they are born. Plumed basilisks are found near water in forests in Panama, Costa Rica, Honduras and Nicaragua and they are quite common. Are there any other interesting facts that you would like to share about plumed basilisks? Why is it referred to Jesus Christ lizard? Is it because it walks on water? Can you keep them as a pet?